Original era manufacture. 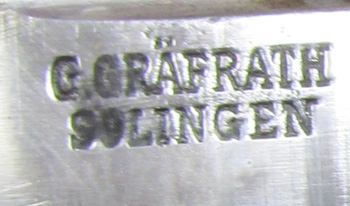 A postwar production, Germanmanufactured gravity knife made by the firm of G. Grafrath Solingen.Four inch polished steel blade in clean condition, with a spring release which allows the blade to retract and extend. Real staghorn grips on each side, with nickel finished metal fittings. Normal age and wear, no damage.